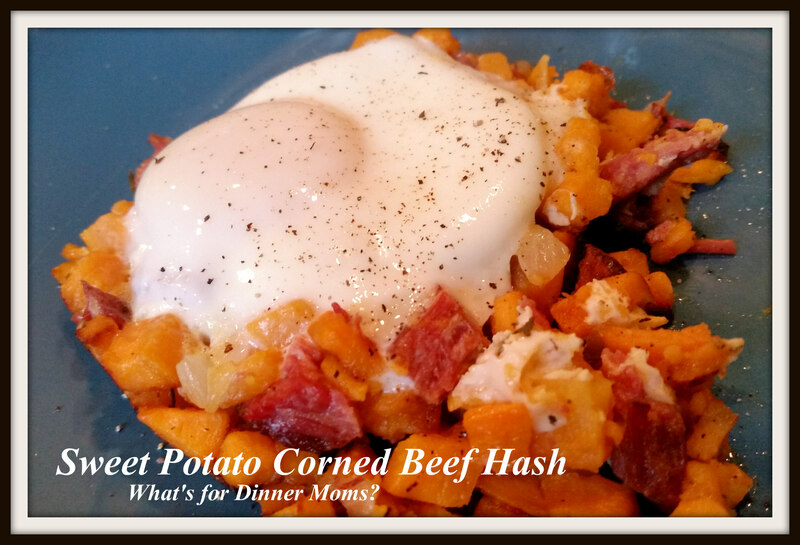 Sweet Potato Corned Beef Hash – What's for Dinner Moms? We love Corned Beef. I buy 4 or 5 during March when they are on sale and keep them in the freezer to pull out at different times to make all kinds of delicious dishes the rest of the year. The other night we pulled out one of the brisket and cooked it in the slow cooker during the day. We had a lovely brisket ready to go to make hash for dinner. Despite everyone being kind of curious about hash made with sweet potatoes they all loved it! It had a really great flavor and the soft eggs over the top added a nice richness to the dish. This was simple to make and made a beautiful meal. Add a side of colorful fruit salad to complete your meal. Melt 3 tablespoons of the butter in a large skillet over medium-low heat. Add onions and jalapeno to pan and saute’ until the onions become translucent. Add sweet potatoes and corned beef to the pan. Cook for 10 minutes stirring often. Once the potatoes have softened add the last 3 tablespoons of butter to the pan and turn up the heat to medium-high. Fry potatoes to crisp and browned. Sprinkle potatoes with thyme, salt, and pepper to taste. Using sweet potatoes is such a good idea!